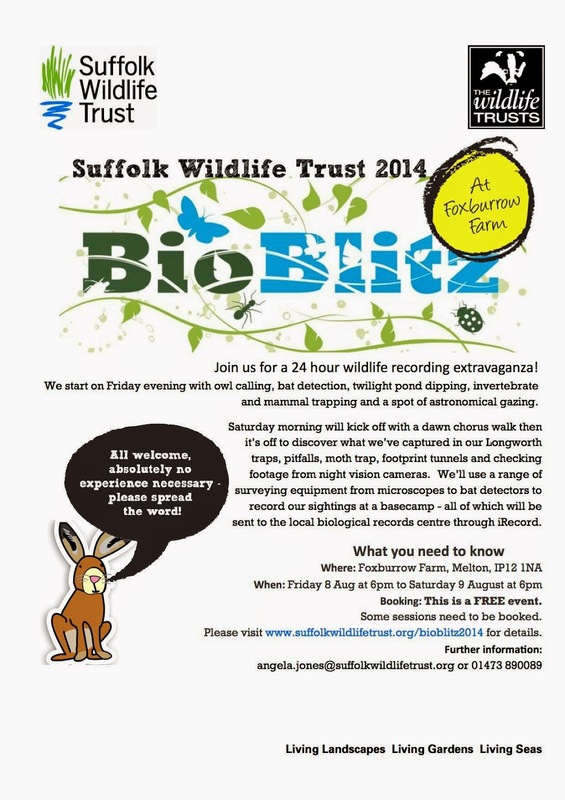 Suffolk Naturalist: Waiting for the bats! Hello one and all, here I am again to enlighten you as to what's been happening in the life of a Suffolk Naturalist. As you have pretty much worked out by now, due to the lack of posts, I've been a bit busy of late and is it any wonder. Just look around you whenever you're out and about and look at all the amazing things going on. There's butterflies, hoverflies, moths, bats and much more busily doing their stuff and I've been out and about trying to record it all. There's also my volunteer work with Suffolk Wildlife Trust which also gets quite busy this time of year as many communities and villages are holding their summer events. I've also been busy doing my voluntary work with the Bat Conservation Trust's bat surveys starting with their roost surveys. The BCT run the National Bat Monitoring Program to monitor how bats are faring from year to year, I've been an active volunteer on this project for about 4-5 years now and started with the relative easy field surveys, which involves walking a 3km (approx) route. During this walk, you listen out for two of our big bat species, Noctule's and Serotine's and when you hear them on your bat detector, you count it. Then you have certain points along the route where you have to stop for 2 minutes and then listen out for a couple of our pipistrelle species, Common and Sopranos, again counting each one you heard. You do one survey in the first two weeks of July and then walk the same route again once in the last two weeks of July. Then simple enter your findings on the BCT page, job done. I love going out in the evening after dinner looking for bats, it's a good way to work off those calories and you never know what you might find. Recently whilst doing a field survey with my good friend Helen, who's new to all this bat stuff, we stood at a check point listening to the passing pipistrelle's when all of a sudden, bold as brass, this little hedgehog came wandering around the corner and walked right up to my feet before realising I was standing there. Lovely evening for a stroll, you'll never know who you'll bump into? Helen was especially pleased as it was her first live hedgehog sighting this year and she said the first thing she was going to do was record the sighting on Suffolk Wildlife Trust's iSpy a Hedgehog survey. As many of you know, hedgehogs are in great danger with their numbers decline dramatically since the 70's. Personally, I put this down to consumerism, lets just think about it? For those old enough to remember, in the 70/80's, things changed a lot in the way we lived. Wages increased dramatically and consumerism began to take off and before you knew it, more and more people started driving to work because more people could afford to buy cars. Nowadays, most households are two car households and the volume of traffic is considerably higher and as a consequence the poor old hedgehog has suffered badly. So now SWT are doing a Hedgehog survey to see how are dear little spiky friends are faring, if you have seen a hedgehog, whether alive or dead, or even if you've had hedgehogs visit you in the past, but not now, then click the link above and record your sighting. Help SWT to help hedgehogs. On one occasion, over near Martlesham, I got a little lost in a wood and ended up coming out onto a country lane in the middle of nowhere, thankfully, a quick look at the OS map on my phone told me that the road eventually lead back to where my car was parked, 2 miles away! A little bit farther than I intended to walk, as I had already covered 2.5 miles, but hey, it was a nice evening and off I went. Every now and then, in the headphones, I kept getting odd little sounds that I knew were not pipistrelle's, many of which were flying back and forth under the tree canopy at the edge of the wood I had just come out from. Unfortunately, this other call didn't have much amplitude (not very loud) and therefore the sonogram (a visual display of the sound) wasn't appearing on my bat detector. At this point I should explain that I am lucky enough to own an EM3 bat detector which has a built in screen allowing the user to visually analyse the bat calls in real time, which is important in identifying certain species of bats, back to the story. So on I walked and eventually I came to a clearing in the hedgerow that looked out onto two fields. The hedgerow that dived the two fields stopped about 20 metres from joint the hedgerow along the roadside, which also had a gap of about 20 metres in it. I think this was so that farm machinery could access both fields. At this point in the darkening blue sky with the deep red glow of a sunset on the horizon, it was easy to see the Common pipistrelle's flying back and forth along the roadside hedgerow and then it happened, that sound I kept getting feint traces of came clicking through the headphones. Looking down at the detector confirmed my thoughts that this was a different bat. These calls, instead of appearing like back to front 'j's (which is the call of the pipistrelle), were more slash '\' like. So I waited, I wanted to see the bat in the evening light, wanted to know where it was coming from and then after about a minute I heard the sound again, this time though I looked up to see it and coming down along the hedgerow that divided the fields came the bat. As it got closer the sound on the detector increased. It flew over my head and into the woods behind me and then another one from exactly the same point came along, another and another. In total I counted about 10 bats of this species all coming from the same direction pass over me and at one point whilst I was getting a precise grid reference from my phone, one flew over and a drop of dark brown pee landed on the screen of the phone, cheers. Now the problem with these calls is that they are the calls of bats who belong to the family Myotis, of which there are 6 different species in the UK, and they all have very similar calls. Fortunately, through the wonders of modern technology, we are able to analyse the calls in a little more detail and are able to put a likely ID to the bat making the call. Whereas, not so long ago, any professional bat surveyor worth their salt would only be happy to ID the bat as Myotis sp. Fortunately, that isn't the case and now there are programs known as 'bat classifiers' which are able to analyse the calls and compare them to 'known' calls of 'known' species of bats. My detector also records all the calls it hears to a SD card, so that when I got home, I uploaded the evenings activities to my computer and began the process of analysing. This involves the computer looking at every single call (each slash) and analysing it and making some notes. These notes were then uploaded to a classifier and compared to the calls it has in its library and the result came back that the calls were very likely to belong to a Natterer's bat (Myotis nattereri). I've recorded these bats before, but when I was on a course with the Field Studies Council at a barn somewhere near Long Melford. But to find and record these bats for myself was great and now I long to find where their roost is. There was a church nearby that I went to check out the following day, however, there was very little evidence of bat activity inside the church. A couple of droppings here and there, but they were old and there wasn't many, so I'm thinking they are not roosting in the church. So, I will have to go back and sit at the other end of the hedgerow from which they approached and a little bit earlier to see where they were coming from and hopefully over the next few nights I might be able to locate them. The roost surveys are also a way of keeping eyes on the bats progress and is even simpler to to do than the field surveys. Go to a roost 15 minutes before the bats emerge and count how many bats leave the roost until they've all gone, simple. Only problem is, you need to know where a roost is to survey it. Thankfully, I know of at least 3 roost sites, two of them I came across as a bat carer when rescuing pups which had fallen out and the other when a friend asked me to look around her property to see what bats were about. The first roost I went too was a bit of a sad story as a couple of years ago, we got called to a house in Ipswich to rescue a pup inside the house. Looking all around the inside of the house, it was clear to see they weren't coming into the house that way. It then turned out that the owners had cats, 3 of them. Cats love bats and the way the bats were getting into the house were through the cats who were catching them and the bringing them home. Me and a friend done a roost count by counting the bats as they emerged from the roost. We counted 37 in 2012. This year we went back and the owners said they had tried to contact us last year but couldn't find our number as they were inundated with bats in the house alive and dead. Again I told the owner that he needed to keep his cats in at night and that would solve the problem, but they refused to believe me saying that their cats were rubbish hunters and couldn't catch anything. We duly waited outside, and 5 minutes before the bats were due to emerge, a cat appeared on the flat roof below the exit of the roost on the side of the house. The cat knew when the bats were due to be out and when the best time was to catch them. We sat there for a whole hour after sunset and not one single bat emerged. They had most likely realised that the roost site was no longer a safe place to bring up junior and roosted elsewhere. For the sake of the bats, I hope they don't return to this site to roost again as it is obvious the owners have no concerns for the welfare of the bats whatsoever and whilst they have cats, the bats will be in great danger. My next site again was something I came across as a bat carer in 2012 when I rescued a Brown Long-eared pup which had fallen out of the attic roost and into the house via the loft hatch. My return visit had me saying hello to the new tenant though who was not a bohemian lady who had great care for her fellow tenants, I was greeted by a gentleman who was only too happy for me to survey his bats and for me to tell him all about them. I did get worried though, because as we chatted it had become apparent that there had been some work to the ceilings and roof since my last visit. I just hoped that this hadn't disturbed the bats. And so I waited and waited and waited and eventually, 50 minutes after sunset, a fluttering black shadow emerged from the apex at the side of the house and fluttered off into the night. This was soon followed by another and another and went on for a good hour before I ended up with a count of 37 Brown Long-eared bats (Plecotus auritus). On my second visit in the latter half of the month I recorded 54 bats there and such a delight to see. Whilst waiting for the bats to emerge I was also greeted with a Little Owl (Athene noctua), a fly pass from a Barn Owl (Tyto alba), a stag beetle (Lucanus cervus) and a Hornet (Vespa crabro). So these surveys get you seeing all sorts of things which is definitely much better than sitting in front of the telly watching Brazil getting thrashed 7-1. Bat droppings on a windowsill. It's only a short video and only shows two bats leaving, the total count from this maternity roost was 77 bats. Sorry for the poor film quality, but you have to remember, the light is really fading fast and I don't want to be shining any bright lights up at a roost entrance. Summer is well and truly here and it's pouring down outside with a few flashes of lightening thrown into the mix as well, typical. The Latitude Festival starts this week and I'll be there in my volunteer roll doing bug hunts in the woods, so if you're passing, please do pop in and say hello! Talking of bug hunts, I was at Bramford Meadows the other week with SWT helping with a moth trapping session and some general bug ID as part of their mini bioblitz type survey of the site which was purchased from the council in 2012. 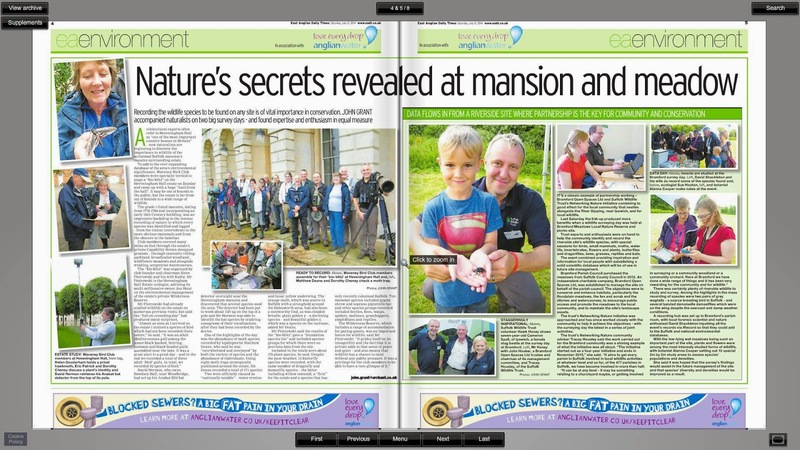 John Grant from the East Anglian Daily Times came down to do a piece on the event and to take some photos too. The weather wasn't so great but still people turned out to get involved, which was great. And it seems my face managed to get in the media again, with a photo even I am happy with. TV, radio and now press. What else is there left for me to appear in??? That's all for now, so till next time keep safe, keep smiling. Nice blog. It sounds like you're having fun there. I certainly enjoyed reading your bat adventures anyway. I also have an EM3+ (a Petterson D230 before that) and have been doing NBMP surveys a while now here in Wales. 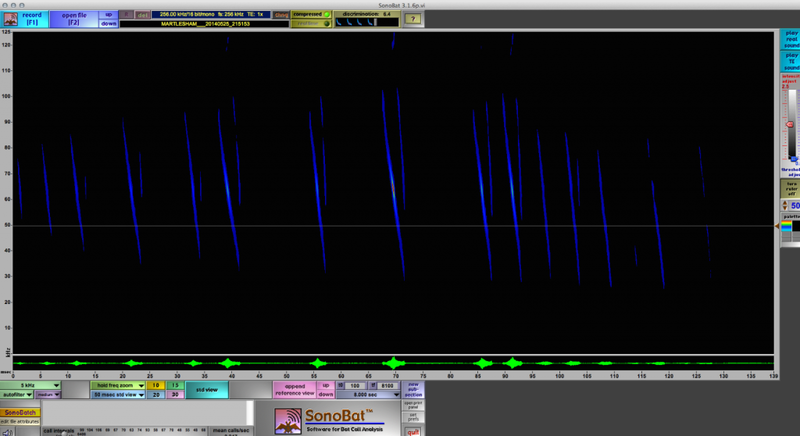 Just out of interest what software/resource are toy using to auto ID your bats? I have just recently purchased Kaleidoscope Pro (expensive but it seems to work quite well). Thanks again for sharing your adventures. Glad that you’re liking the blog, I also upgraded from a Pettersson D230. 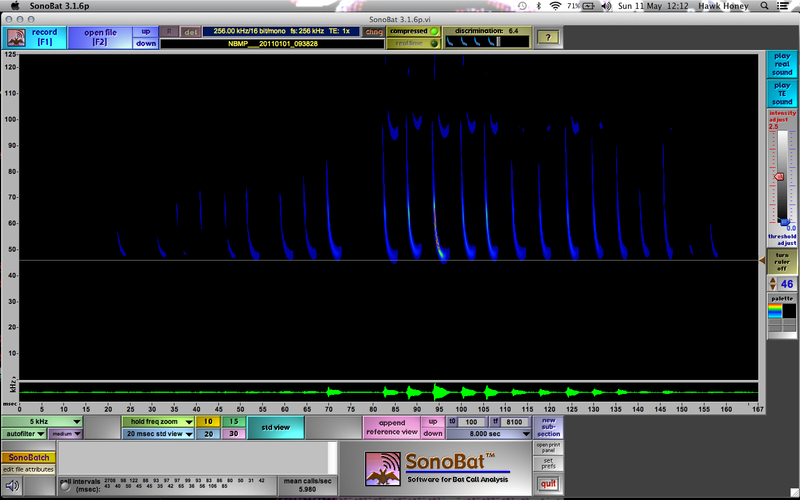 As for software to ID the bats, I use the free online iBats classifier (http://ibatsid.cloudapp.net) along with posting my more tricky finds on the Facebook Bat Call Sound Analysis Workshop page. Very helpful professionals on there willing to share their experience. Thanks for the info. I'll take a look at those links.